Design and teach effective learning goals and objectives by following strategies based on the strongest research available. This book includes a summary of key research behind these classroom practices and shows how to implement them using step-by-step hands-on strategies. Short quizzes help readers assess their understanding of the instructional best practices explained in each section. Review research on goal setting. See the effect of well-designed and well-taught goals and objectives on student achievement. Gain concrete, detailed recommendations for classroom practice. Build in-depth understanding of how to design and teach classroom goals. Use as a personal resource or as a group study tool for teacher teams or entire faculties. Engage in short quizzes and exercises that assess your learning of how to apply these strategies. 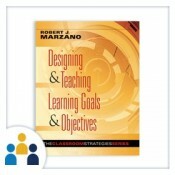 “In Designing & Teaching Learning Goals & Objectives, Robert Marzano brilliantly translates goal-setting research into thought-provoking and doable professional practice. In chapter 2, he makes important distinctions between goals and assignments and shows readers how to translate general standards statements into specific learning goals. As a result, educators can (1) become much more precise about what they want their students to know and be able to do and (2) be better able to effectively communicate these specific learning goals to their students. 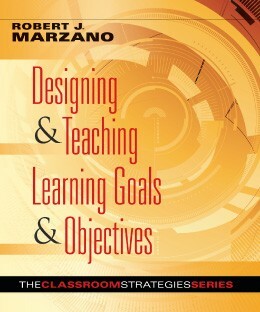 “In chapter 3, Dr. Marzano provides both the rationale and process for developing student learning goals at four different levels of difficulty—the very essence of differentiation—to assist educators in better meeting the diverse learning needs of all their students: ‘By designing goals at different difficulty levels, the teacher can ensure that each student is challenged without being overwhelmed.’ Educators need to know before planning instruction the level of thinking difficulty a particular learning goal represents so they can design a matching set of aligned instruction, learning tasks, and assessments that will provide credible evidence as to whether students have achieved the targeted goal and at what degree of proficiency. Such alignment will enable teachers to more accurately diagnose specific student learning needs and modify their instruction accordingly. “The book is highly interactive, engaging readers to immediately work through the process and construct their own deeper understanding of the ideas in focus. Valuable reproducibles for exercises and quizzes (along with provided answers for follow-up self-checking!) assist readers in doing so. Numerous cross-disciplinary examples of and practical strategies for differentiating levels of complexity in complex procedures will prove welcome guidance for busy educators.